Pioneer Crossing Casino offers the best promotions and giveaways in town. From spectacular giveaways to huge cash payouts, there’s always something going on at Fernley’s Pioneer Crossing Casino. And with so many amazing promotions, your chances of walking away a winner are higher than ever before. Spin the Big Wheel to Win Up To $1,000! Roll the Dice to Win Cash and FreePlay! See Guest Services for details. Pioneer’s Players Club members earn more rewards when they play. With different promotions offered to members every day of the week, your chances of winning are better than ever when you card in. Multiplier will be for the day! Join us every Tuesday from 5am-midnight! Earn 14x Tickets for Friday AND Saturday Drawings! Join us TUESDAYS-THURSDAYS 6AM – MIDNIGHT Swipe at the new kiosk daily (Tues-Thurs). Everyone is a Winner! 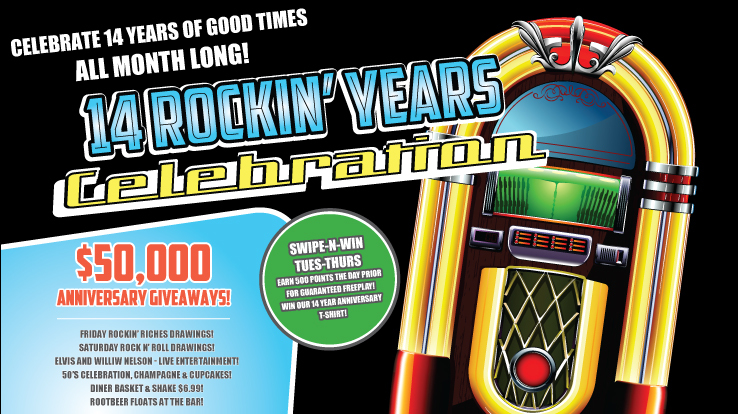 Win Cash, FreePlay, Food Comps, Free Dessert, Drawing Tickets, AND our 14 YEAR ANNIVERSARY TSHIRT! Earn 500 a day before and get a second swipe with guaranteed FreePlay prizes! Spin the Big Wheel to Win Up To $1000! Join us for Friday Drawings from 4:30pm – 10pm! Roll the Dice to Win Cash and FreePlay!! Join us for Saturday Drawings from 3pm – 9pm! Swipe at the kiosk to win FreePlay, Comps, Points, and more! That’s right – we offer more BINGO for more chances to WIN! Join us every Thursday from 10am-9pm for your chance to WIN WIN WIN! Pioneer Crossing is the Home of the $10,000 Blackout BINGO! On every Monday and Wednesday redeem your Free Play coupons from your mailer. Didn’t get one? Sign up with our Player’s Club today! Redeem Bonus Play coupons from your mailer for Free Play on Fridays! Didn’t get one? Sign up with our Player’s Club today! There’s always something fun and exciting happening at Pioneer Crossing Casino. Whether you’re seeking live entertainment, tournaments, giveaways or more, you’ll find it all here.